1) Isopropyl Alcohol: Dries and Breaks African American or Ethnic hair. It is found in color rinses, anti-freeze. 2) Mineral Oil/ Petrolatum: It used as a moisturizer in African American or Ethnic hair care products; however, it coats African American or Ethnic hair, actually preventing moisture from getting into the thirsty hair. It is a derivative of crude oil and a cheap industrial grease component. It also prevents the release of toxins from African American or Ethnic hair and alters the skin respiration by preventing oxygen release. 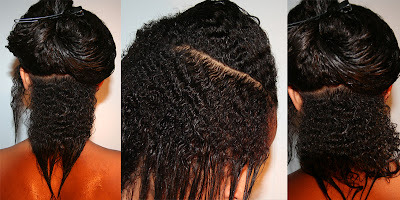 3) Polyethylene Glycol (PEG): Strips African American or Ethnic hair of critical moisture. Used as an emulsifier in products, dissolves oils and grease. 4) Propylene Glycol (PG): An active component in many African American or Ethnic hair care products, make up, lotions, mouthwashes, and deodorant, PG is the active component of anti-freeze and actually deteriorates the protein and cellular structure of African American or Ethnic hair. Protein is what your hair needs to thrive. Workers actually use gloves and goggles when dealing with this substance due to its chemical side effects and toxicity. 5) Sodium Lauryl Sulfate (SLS)/ Sodium Laureth Sulfate (SLES) : A cheap foaming and thickening agent that strips African American or Ethnic hair of moisture and causes skin and scalp irritation. 95% of all hair shampoos contain this ingredient or a derivative. Avoid it completely; TEA lauryl is just as bad, if not worse. Do not be fooled by the use of the word TEA. Shampooing African American or Ethnic hair with a product that contains these can lead to the absorption of excessive nitrates. 6) Diethanolamine (DEA), Momoethnanolamine (MEA), Triethanolamine (TEA) : Usually listed as an ingredient containing a neutralizing compound, i.e. as Cocamide DEA or Lauramide DEA, repeated skin applications of DEA-based detergents are known to form cancer causing nitrates. Hi! I first must say that your blog is very nice and so informative. I have been meaning to do a similiar list of bad ingredients to share with my readers but never got to. This is a great list and I must share it *if you don't mind*. Keep up the good work!